LEFT: XB259 when it was at the Museum of Army Transport. Like all the other Beverleys, XB259 was built at Brough, East Yorkshire. It first flew on 29th January 1955, and last on 30 March 1974, landing at Paull Airfield, Hull. XB259 never saw squadron service with the RAF. It was retained by Blackburn Aircraft and given a civilian registration – G-AOAI. It was used for tests and modifications. These tests included RATOG (Rocket Assisted Take-Off Gear) using Napier-Scarab rockets. 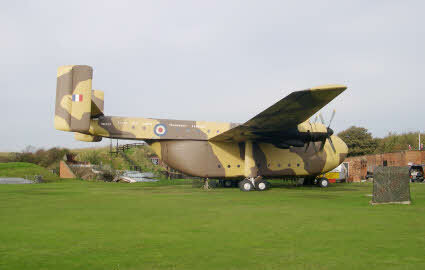 It was later numbered as XB259 and transferred to RAE (Royal Aircraft Establishment) Farnborough where is was used to aid the development of supply dropping techniques. It was also used to test the braking parachutes to be used in the Victor and Vulcan ‘V’ bombers. In the early 1970s, XB259 was retired from military service and sold to the now defunct Court Line as an attraction. Following the collapse of Court Line, it was purchased by North County Breweries for a similar purpose, and kept at Paull Airfield. The use of the Beverley as an attraction failed, and it was put up for sale as scrap. Fortunately, Mr F. Daly of the Waterfront Hotel, Hull saved the aircraft and in April 1983 it was moved to the Museum of Army Transport at Beverley,East Yorkshire. LEFT: By 2001, XB259 desperately needed painting to provide some protection against the elements and to curb deterioration. The painting was carried out over a over a 15 day period during September and October. Unfortunately, ‘Hammerite’™ paint had been used on the aircraft previously, and this caused difficulty in preparation work. All the old paint was stripped off, and 200 gallons of paint provided three coats of protection on the 13,658 square feet of airframe. RIGHT: XB259 at the Museum of Army Transport following its repainting. Whilst some, myself included, may have preferred the reproduction of a particular squadron aircraft, the Museum had decided to use a camouflage paint scheme without squadron markings as XB259 had not seen squadron service. Camouflage paint would also provide better protection from the elements. Only aircraft 84 Squadron, and the ill-fated XL150 of 34 Squadron had been camouflaged. Despite camouflaged Beverleys having black under surfaces, a ‘wrap around’ camouflage paint scheme was used. This was on the advice of painting contractors. Black undersides would have caused humidity problems thus giving long term preservation difficulties. On balance it was though better to ensure a long term future for XB259, rather than present a 100% accurate colour scheme. The Museum of Army Transport closed for the last time in Summer 2003, once again putting the future of XB259 in doubt. The aircraft was put up for sale by tender and was eventually purchased by the owners of Fort Paull, a preserved coast artillery fort located at Paull near Hull, close to the airfield where XB259 made her last landing. Moving the Beverley was no simple task, but successfully accomplished by road in several loads. 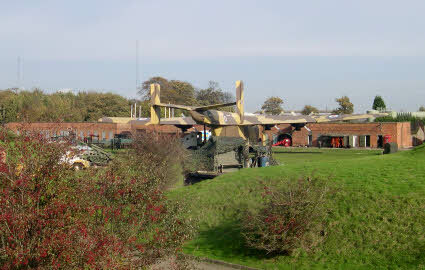 On arrival at Fort Paull, a large crane was used to lift the large parts of the airframe over the fort’s walls. Once the rebuilding of XB259 commenced, steps were taken to preserve the airframe and to combat corrosion. May I introduce myself? I am Teddy Penn, was Director of the Museum of Army Transport from 1983 to 1988 and was responsible for the move of XB 259. I am most impressed with your Association web site and especially interested in that part concerned with 259. Most enjoyable and fun for me to be reminded of those great days am now somewhat removed in Wiltshire and haven't been to the museum for many years. May I make a few, entirely uncritical, points about the history of 259 from my memory, which might well be and often is in error? In April 1983 Francis Daly offered 259 on loan to MAT but had no part in the move, which as you can imagine was a mammoth task with zero funds to allocate to the project. MAT is not MOD funded. He had previously made the offer in 1981 but we were still at Leconfield and couldn't accept. It was in the end moved almost entirely by self help and a lot of sponsorship in kind as many found the idea attractive. It should be remembered that at the time we had no thought that we might be preserving the last of the line. It was all done for fun and the poetry of moving the Beverley into Beverley. Two former senior members of BAeS Brough undertook the planning and supervision Bernard Watson, war bomber pilot and BAeS flight testing engineer and Rod Melling, head of Future Concepts (?) and whose widow later left the fund £5,000. It took two years to move, restore and reassemble. Restoration was thorough. New oleos, I think new tyres and much cockpit equipment which had been removed from the aircraft earlier. I am surprised at the report that Hammerite was used. My memory is that a Hull paint firm prepared and donated the paint to the original Bev spec. I never heard of Hammerite being used. I always understood, perhaps incorrectly, that Court Lines used 259 for the global move of replacement parts such as engines. The reason that 259 was left at Paull was that the club had closed down and the aircraft could not be flown out. We considered the possibility of flying it out but far too late of course. During the taking to pieces stage the aircraft was, of course, very vulnerable to damage and theft (over a period of about 3 months) during which time someone had to live on site in a caravan. This was usually Bernard Watson Paull isn’t as much fun as Blackpool. Many thanks.